Figure 1. The patient's large erythematous eruption. Figure 2. Post-inflammatory hyperpigmentation in a child who had multiple fixed drug eruptions secondary to paracetamol. Figure 3. An acute fixed drug eruption secondary to an antibacterial agent. 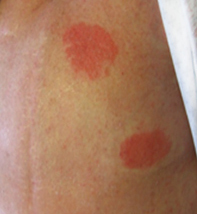 A 70-year-old woman presents with a persistent, uncomfortable and slightly eroded submammary rash that has been present for several weeks (Figure 1). She complains of a burning sensation in the rash. The rash has been treated with a potent topical corticosteroid, without improvement. A skin scraping and culture have not shown evidence of a fungal infection. The patient’s current prescribed medications are telmisartan, simvastatin and aspirin, and she also takes paracetamol for osteoarthritis. She is afebrile, and blood tests show a normal white cell count. Cellulitis. This infection of skin and soft tissue is characteristically asymmetrical (with a lack of distinct margins), erythematous, warm, painful and tender to touch. There may be associated swelling and blistering, erosions, crusting and discharge as the infection progresses. In nonimmunosuppressed patients, cellulitis is most commonly caused by group A beta-haemolytic streptococci; an entry point for bacteria may be apparent at a site of decreased skin integrity. A patient may also have generalised systemic symptoms, such as fever, chills and malaise – these would be suggestive of bacteraemia secondary to the cellulitis. In an afebrile patient with a normal white cell count, cellulitis would be very unlikely. Psoriasis. Large patches of plaque psoriasis are typically well demarcated and salmon-pink in colour. The lesions are typically scaly and slightly raised, although in intertriginous areas the scale may be less apparent. A patient may report itch and soreness, but a burning sensation would be very unusual. The submammary area is often involved in psoriasis, but the sudden appearance of a large area of plaque psoriasis on the trunk would be atypical in a patient who does not have a history of psoriasis. Giant urticaria. The hallmark of urticaria is a very itchy (not burning) migratory eruption, which occurs most often as a result of histamine release from mast cells in the skin. There is no disturbance of the epidermis. Urticaria is often recurrent, with a red edge and central clearing, and it may occur as an adverse effect of a medication. It would not be the likely diagnosis in the case described above because the rash is fixed and the epidermis is disturbed. Candida and tinea. Candida spp. can produce a submammary rash, but are not likely in this patient because a skin scraping has not revealed the organism. In addition, it would be unusual for a fungal infection to appear over a large area in such a short time – the usual history is of a small inflammatory and erythematous lesion that has gradually expanded through its active outer edge, and the rash is typically surrounded by satellite lesions and pustules. Tinea is a consideration, but it can be excluded in this case on the basis of the negative fungal scraping and culture results. Fixed drug eruption. This is the correct diagnosis. The acute lesion of a fixed drug eruption tends to occur very rapidly, within 30 minutes to eight hours after administration of the culprit medication. The lesions are characteristically tender, dark red macules and plaques that produce a sore or burning sensation and may blister. In this patient’s case, the edge of the rash is erythematous, inflamed and eroded, with characteristic hyperpigmentation centrally. The rash can present on any part of the skin; it may also occur as an erosive mucositis on the genitalia and perioral regions. Typically, lesions appear erythematous initially, but they resolve with hyperpigmentation (Figure 2). Fixed drug eruptions are an adverse event caused by many drugs; sulfonamides are common offenders (Figure 3). However, over-the-counter medications such as paracetamol and ibuprofen, which are often not reported by patients as part of their medication schedule, are also implicated. Although the rash can be uncomfortable, it remains localised and for this reason is not as severe as a generalised drug eruption. When a fixed drug eruption is due to a medication that is taken on an occasional basis, such as paracetamol, the lesions initially tend to occur in the same location, but with repeated exposure new lesions develop in different areas. When a fixed drug eruption is due to a medication that is being taken daily, it produces a persistent, bizarre rash that is resistant to all treatment but clears quickly when the offending medication is ceased. A high degree of suspicion is required to diagnose a fixed drug eruption. A medication history and information about previous reaction sites are very informative. The diagnosis can be confirmed by a skin biopsy, which will reveal a lichenoid reaction pattern with prominent pigmentary incontinence that results in the clinical appearance of hyperpigmentation. An oral challenge may be performed and will reproduce the rash. For a patient who has been taking multiple medications, this may be the only way to confidently determine which one was responsible. Cessation of the offending drug will resolve a fixed drug eruption. A short course of oral prednisone (0.5 mg/kg per day) will provide rapid relief of symptoms in severe cases. Without treatment, the rash resolves in seven to 10 days after cessation of the offending drug. A potent topical corticosteroid will provide symptomatic relief until the rash resolves. It is common for post-inflammatory hyperpigmentation to occur, even when the rash has been treated. The offending drug should not be administered again or the rash will recur. In some patients, related drugs will produce the same rash if given in the future. In this patient’s case, a skin biopsy was performed and confirmed the diagnosis. Her use of all medications except telmisartan was ceased, and the rash persisted. Telmisartan was then ceased, and the rash resolved. Her antihypertensive was changed to perindopril; she did not restart telmisartan and has remained well.